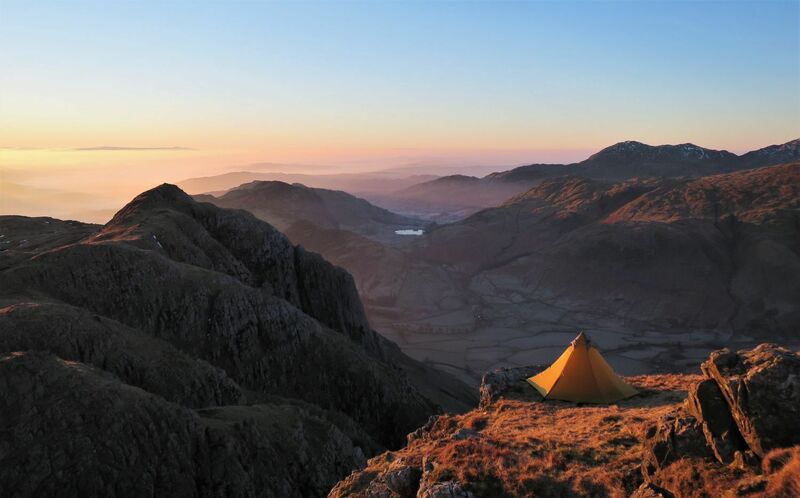 Even though High Stile is our favourite summit to wild camp on, Pike o’ Stickle certainly comes in at a close second. 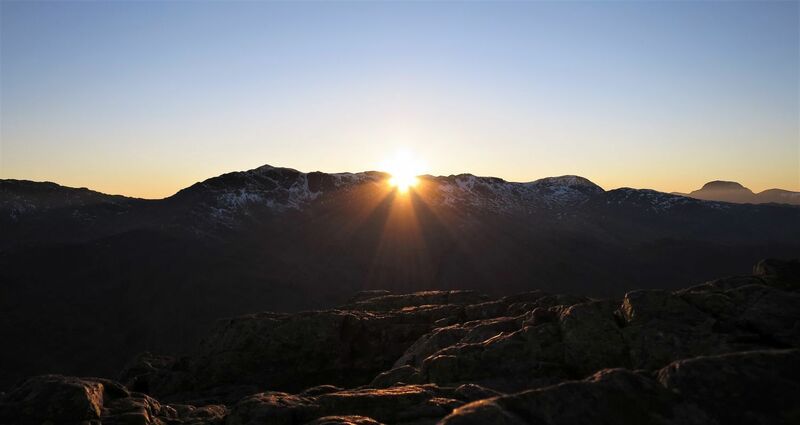 With its prominent position looking over Mickleden, and being surrounded by impressive tops like Crinkle Crags, Bowfell and Harrison Stickle, the views are simply superb in all directions. If that isn’t enough, the pitch location just a couple of feet away from a 600 foot drop keeps the excitement flowing; just remember where you are when you get out at 2am for toilet duties! 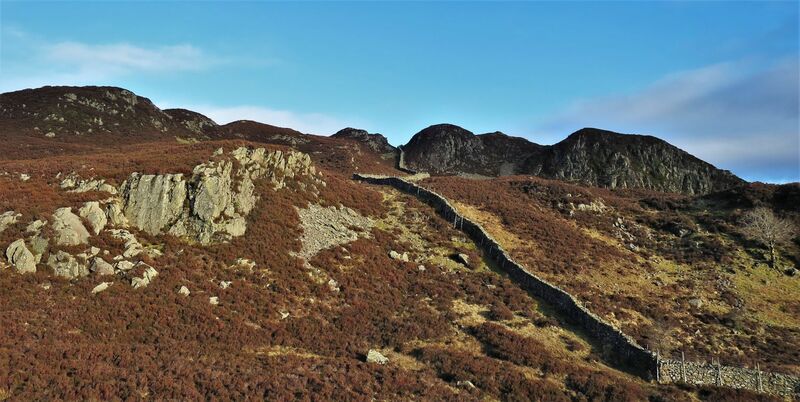 On this occasion we decided to park at Stonethwaite in Borrowdale and walk the distance to the Langdale Pikes via High Raise, which is another superb summit that provides fantastic views of the Southern, Western and North Western Fells. The next morning we returned via Ullscarf, and then we took an unorthodox pathless route from Low Saddle to Dock Tarn, however, an easier route to High Crag from Low Saddle can be used if you choose not to visit Dock Tarn. Please note that a great water source can be found at Dungeon Beck, between Loft Crag and Harrison Stickle. 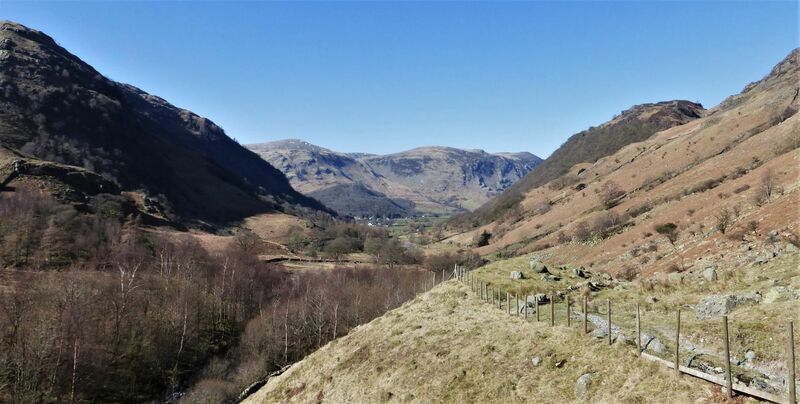 During the initial stages of our journey, through Stonethwaite and Greenup Gill, our attention is drawn behind us to the lovely scenery. 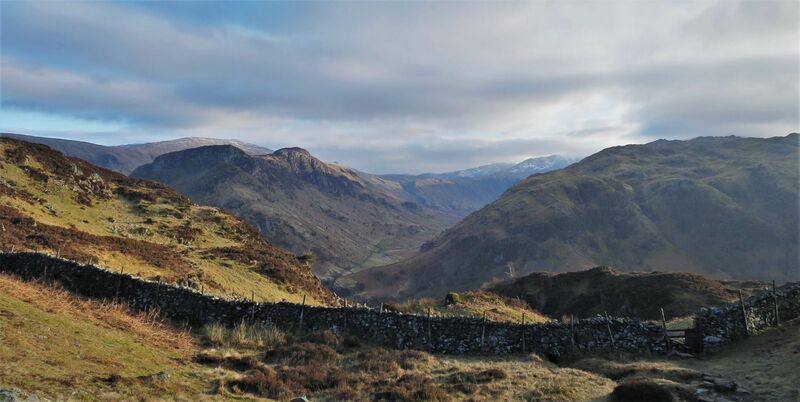 The tip of Lining Crag appears over the upper cascades of Greenup Beck. 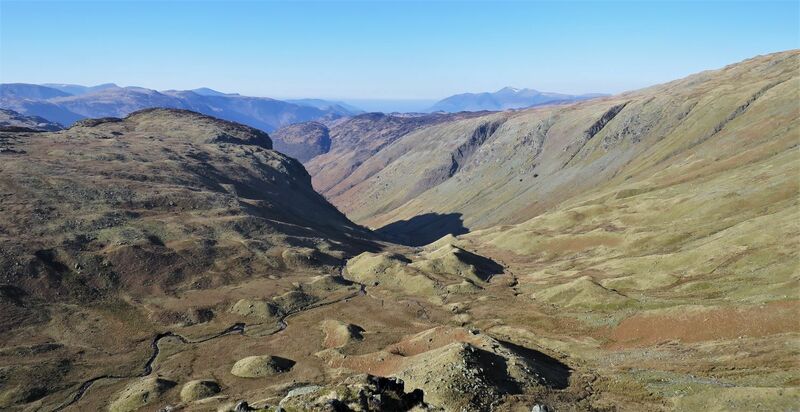 Alfred Wainwright describes the upper basin of Greenup Gill as “a strange upland valley of moraines!”, personally I find it magical, and the view from the top of Lining Crag has to be one of the best in Lakeland. 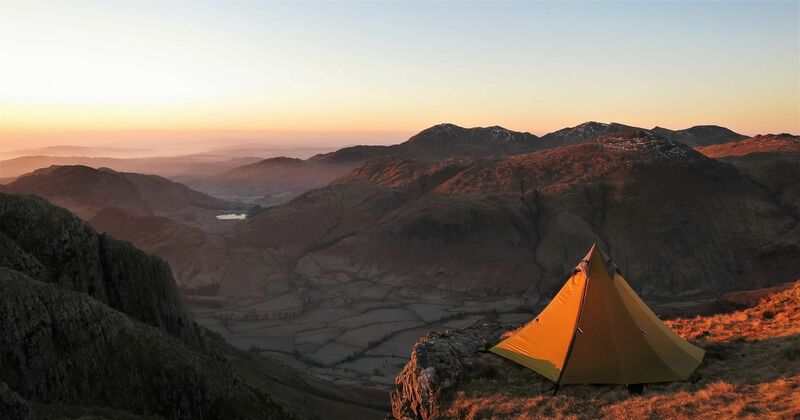 High Raise, contender for the best summit view in Lakeland? Here we traversed the western flank of Thunacar Knott to take a more direct route to Pike o’ Stickle. The head of Harrison Combe is to our left and the valley of Langstrath to our right. 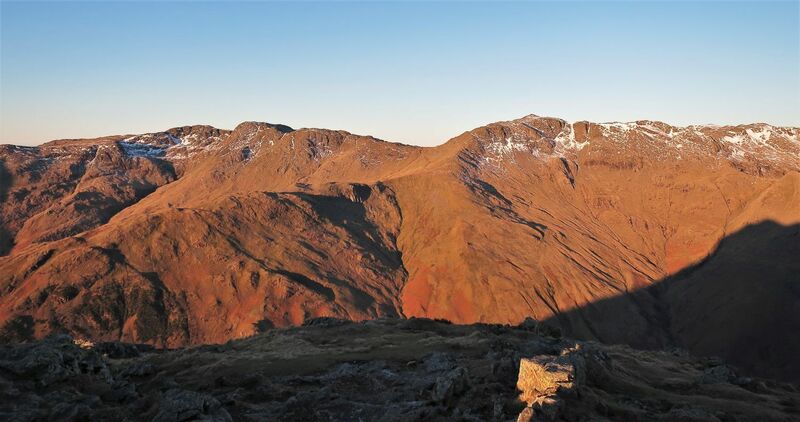 It’s when you see the shadow of Pike o’ Stickle that it reminds you that you are on such a ‘pointy’ top. How wonderful to wake up to inversions over Vale of Keswick and Langstrath. 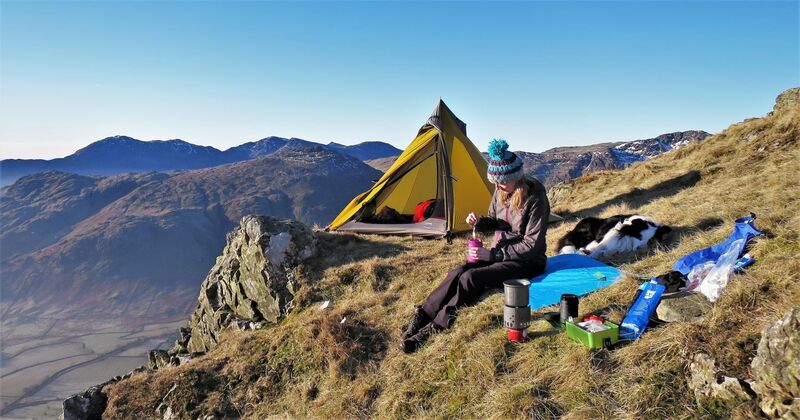 As you can see in the picture, there’s only enough room for one tent on Pike o’ Stickle; who needs a neighbour anyway? I don’t think my wonderful family are wanting to go home! Jaclyn is like a sniper with that camera! Yet again Pike o’ Stickle casts a shadow, this time on the edge of Martcrag Moor. It was amazing to watch the inversion flow over the edge, and to see the Rossett Pike Ridge acting like a dam. It was fantastic to witness this fog bow (left side) on Martcrag Moor. 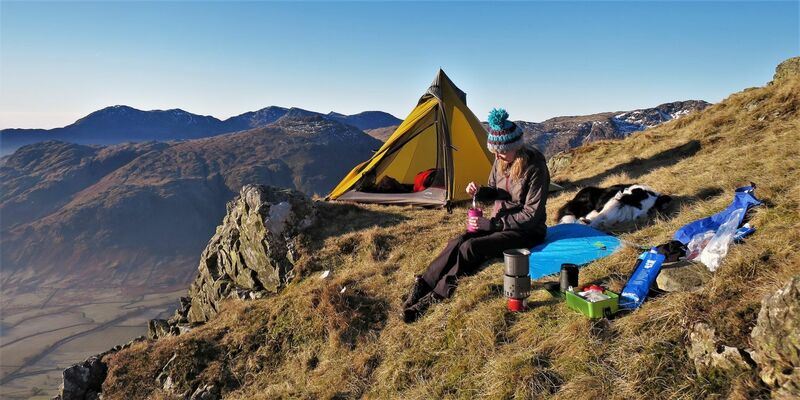 Sadly Jaclyn missed this as she stayed with the tent on Pike o’ Stickle. It’s now time to leave and head home. Frankie checks out the route as we scramble off Pike o’ Stickle. High Raise is full of surprises! From leaving Low Saddle we took an unorthodox pathless route over Black Knott to Dock Tarn, however, an easier direct route to High Crag can be used if you choose not to visit Dock Tarn. Amazingly, before we started the descent into Stonethwaite, we noticed the very tip of Pike o’ Stickle peeking over the flank of Sergeant’s Crag; seen left of centre in the picture; High Raise is the dome top just behind Eagle Crag and Sergeant’s Crag.